Biology: An Everyday Experience is designed for students with a broad range of abilities. This comprehensive course of study in biology emphasizes fundamental concepts of biology and their everyday applications, critical-thinking and study skills, and hands-on experiences. 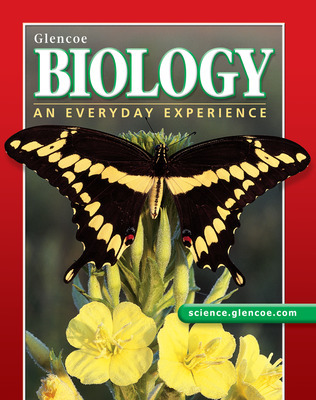 The text applies the study of biology to students' everyday worlds, thereby making it relevant and exciting. Everyday analogies illustrate all major concepts and make biology more understandable. The program has a controlled reading level to allow the presentation to be accessible to all students. Makes complex concepts easier to grasp with everyday analogies, on-target reading level, and a controlled vocabulary. Promotes visual learning with Idea Maps that provide graphic representations of the main ideas in each lesson. Captures students’ attention and keep them motivated with hands-on activities and skill exercises in every chapter. Piques students’ interest with Focus masters that provide interesting graphics and inquiry questions to introduce each chapter.